If you’re dealing with arthritis, you may have pain in your back, neck, shoulders, hips, knees, feet, joints — or all over your body. At Wellness 1st Integrative Medical Center in Gilbert, Arizona, the highly skilled holistic health care experts understand exactly how to minimize your pain and other symptoms to help you live your best life, all without surgery or invasive treatments. Use online booking or call to schedule an appointment now. Arthritis comes in many forms and generally means you’ve got inflammation in your joints. The exact cause of that inflammation depends on the kind of arthritis you’re dealing with. Fibromyalgia, while technically a central pain syndrome rather than a type of arthritis, is often included as a type of arthritis because it can cause symptoms very similar to rheumatoid arthritis. In addition to the pain, you’re likely to have swelling around the affected joints, stiffness, range-of-motion problems, and red skin around the affected joints. Arthritis symptoms can become debilitating if you don’t take action to relieve them at their source. At Wellness 1st Integrative Medical Center, the team believes in going the extra mile to find out exactly why you’re suffering from arthritis symptoms. Knowing the precise origin of your pain and other symptoms allows your doctor to treat you at the source using integrative holistic methods, rather than writing you a prescription and sending you on your way. People suffering from arthritis often benefit from a customized program that includes brain-based therapy and peak lifestyle programs. Your doctor performs a full neurological and dietary workup to determine the source of your arthritis pain, and then uses that information to create your customized program. These programs include customized strengthening exercises, cold laser therapy, moist heat application, cold therapy, stress management strategies, and other personalized treatments. You’ll also get personalized nutritional counseling. Often, healing your gut is a key factor in your arthritis treatment. This often starts with eliminating the foods that increase inflammation levels within your body, and adding in healthy fresh foods that reduce inflammation. You might eliminate a lot of processed foods, gluten, dairy, or extra sugar during this time. Your doctor may also recommend a customized blend of supplements, or other specific lifestyle changes to help you overcome the inflammation causing your arthritis flare-ups. 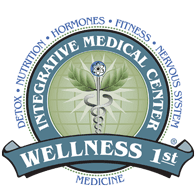 Book your appointment at Wellness 1st Integrative Medical Center now by using the online tool or by phone.